As a rule, we do not form general partnerships and will simply decline the work if asked to do so. Why such a strong stance? Because it makes no sense to form a business entity exposing partners to individual liability for all of the partnership’s debts and obligations, not to mention the wrongful acts of other partners, without any real countervailing benefit to the partners. Once upon a time, partnerships offered a significant tax advantage over other forms of business. The partnership tax provisions impose only one layer of tax at the owner/partner level, while corporations bear two levels of tax, once at the entity level and again at the owner/shareholder level. But partnerships pay a heavy price for those tax benefits. By contrast, limited liability is not a benefit enjoyed by partners in a general partnership. Partnership statutes specifically provide that partners are liable not only for the debts and obligations of the partnership, but also for the wrongful acts of other partners. These statutes have been interpreted to mean just “what they plainly say: general partners are jointly and severally liable to nonpartner creditors for all wrongful acts and breaches of trust committed by their partners in carrying out the partnership’s business, and jointly liable for all other debts to third parties.” So if your partner defrauds a third party, completely without your knowledge, you are still on the hook for any losses caused by the fraud. That is potentially a very steep price to pay in order to enjoy the tax benefits of the partnership form of doing business. That is where the limited liability company comes in. In 1977, Wyoming became the first state to allow business entities to form as limited liability companies. The crucial development came in 1988, when the Internal Revenue Service formally permitted limited liability companies to be taxed only at the owner level, just like partnerships, while still enjoying the benefits of corporate-style limited liability. Since then, all 50 states and the District of Columbia have passed statutes allowing the formation of limited liability companies, and with good reason. If owners can enjoy the tax advantages of a partnership, without exposing themselves to the unlimited liability of general partners, why not form a limited liability company instead? 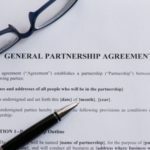 There are no cost savings in forming a general partnership, as it is just as much work to prepare a partnership agreement as it is to draft an operating agreement for a limited liability company. And the peace of mind from limited liability is well worth the extra cost of the small annual franchise tax paid by a limited liability company. That, in a nutshell, is why we don’t form general partnerships. See Miranco Contracting, Inc. v. Perel, 57 A.D.3d 956, 958, 871 N.Y.S.2d 310, 313-14 (2d Dep’t 2008). Bartle v. Home Owners Co-op., 309 N.Y. 103, 106, 127 N.E.2d 832, 833 (1955). Am. Federated Title Corp. v. GFI Mgmt. Servs., 126 F. Supp. 3d 388, 402 (S.D.N.Y. 2015). See, e.g., Cal. Corp. Code § 16305(a) (“A partnership is liable for loss or injury caused to a person, or for a penalty incurred, as a result of a wrongful act or omission, or other actionable conduct, of a partner acting in the ordinary course of business of the partnership or with authority of the partnership.”); id. § 16306(a) (“[A]ll partners are liable jointly and severally for all obligations of the partnership unless otherwise agreed by the claimant or provided by law.”); N.Y. P’ship Law § 24 (“Where, by any wrongful act or omission of any partner acting in the ordinary course of the business of the partnership, or with the authority of his copartners, loss or injury is caused to any person, not being a partner in the partnership, or any penalty is incurred, the partnership is liable therefor to the same extent as the partner so acting or omitting to act.”); id. § 26 (“[A]ll partners are liable . . . [j]ointly and severally for everything chargeable to the partnership under section twenty-four and . . . [j]ointly for all other debts and obligations of the partnership[.]”). Ederer v. Gursky, 9 N.Y.3d 514, 521-22, 881 N.E.2d 204, 209 (2007); see also J&J Sports Prods. v. Flores, 913 F. Supp. 2d 950, 956 n.1 (E.D. Cal. 2012) (“[G]eneral partners are . . . jointly and severally liable for the obligations of the partnership, including liability for misconduct committed by the partnership against third parties.” (citation omitted)). See Hamill, supra note 1, at 1460; see also Cal. Corp. Code § 17101 (a) (“[N]o member of a limited liability company shall be personally liable under any judgment of a court, or in any other manner, for any debt, obligation, or liability of the limited liability company, whether that liability or obligation arises in contract, tort, or otherwise, solely by reason of being a member of the limited liability company.”); N.Y. Ltd. Liab. Co. Law § 609(a) (“Neither a member of a limited liability company, a manager of a limited liability company managed by a manager or managers nor an agent of a limited liability company (including a person having more than one such capacity) is liable for any debts, obligations or liabilities of the limited liability company or each other, whether arising in tort, contract or otherwise, solely by reason of being such member, manager or agent or acting (or omitting to act) in such capacities or participating (as an employee, consultant, contractor or otherwise) in the conduct of the business of the limited liability company.”). See Hamill, supra note 1, at 1460.